Students from the CAST civil engineering technology program spent this past spring quarter at the American College of Management and Technology. They took advantage of the open-air markets near their apartments in Dubrovnik. Seventy-six undergraduate students started this fall at RIT Dubai. 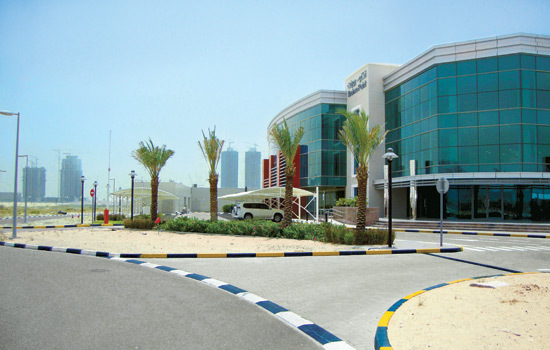 They are the first undergraduate students to enroll in engineering, business, service management and information technology courses since RIT Dubai opened with graduate courses in 2008. Focusing on this type of relevant coursework to encourage workforce development has made for a strong, strategic partnership between Dubai and RIT, says Harvey Palmer, dean of RIT’s Kate Gleason College of Engineering. Halfway around the world, the same approach is being taken at RIT’s college in Croatia, the American College of Management and Technology, where undergraduate programming also will expand. Success in each of the regions will have as much to do with providing relevant educational resources as understanding the unique qualities and goals of the countries and ensuring that there is a bridge between the Henrietta campus and its international peers. “We have to have a link between RIT and the Dubai campus that is seamless. There must be an easy flow of professors, staff and students, otherwise this will diverge into two different entities and this enterprise might not work,” says Hany Ghoneim, professor of mechanical engineering in the Kate Gleason College of Engineering. He took a one-year leave of absence from the Henrietta campus to teach undergraduate engineering courses at RIT Dubai and lead the program. He also is acting as an academic advisor. Ghoneim, who has been with RIT since 1983, was raised in Egypt and educated at the University of Cairo. He has lived, traveled and taught extensively in the region. For Hudspeth, expanding the number of programs being delivered in Dubrovnik is a chance to widen study abroad opportunities for students on the Henrietta campus and to increase the program options for students in Croatia and the surrounding area. “Increasing the number of study abroad students at ACMT remains one of our key initiatives, and last year 62 students from the Rochester campus spent a quarter in Dubrovnik. This represents an increase of 77 percent over the previous year,” says Hudspeth. One of those reciprocal arrangements took place during spring quarter this past year as 12 civil engineering technology students traveled to Croatia to take several of their upper division classes. Their professor, Scott Wolcott, accompanied them and taught the classes, Dynamics and Waste Water Treatment. “The students took a third class from one of the professors at ACMT or an online course, engineering economics. Some took 16-credit hours,” he says, adding that all courses were part of the students’ degree program, keeping them on target for graduation. Wolcott also serves as the undergraduate coordinator for the civil engineering program in RIT’s College of Applied Science and Technology. “We covered the same material we would in Rochester but it was the out-of-class part that was different,” says Mel Miller, a fifth-year civil engineering technology student from Portland, Ore. In Dubrovnik, the group took field trips to different engineering facilities, including a wastewater treatment plant. They learned that Dubrovnik’s groundwater supply comes from mountains nearby. The topography of the land forms a river right at the base of the mountain, and the water treatment facility taps into that source, treatment is administered and it is then distributed to the community. Back in Henrietta, plans for more of these study abroad opportunities are under way. Ghoneim expects RIT Dubai students to travel to the Henrietta campus for Senior Design and other upper level courses, and vice versa for engineering students locally to attend RIT Dubai. A similar exchange would take place for Croatia.